First touch soccer is a very addictive game , i got to know the game during the 2016 version , at first i was shocked at it size, and i said to myself 'what good can come out from a game with such size' not till i tested it , i was so surprised , although the graphics wasn't that good yet it was awesome. something really about game is its speed and control, this game has both ,and it runs on many devices and smoothly also. If you ever feel bored try this game and you might be running to get your power bank every now and then , lolz. The First touch soccer 2018 isn't like the 2017 version , although i wasn't that into the FTS 2017 , but only one thing i will tell you , this game is a bomb for such size. First Touch Soccer is also available for IOS DEVICE , they have been hitting us with lots of mods and version to keep us glued . An android version v4.0 and above. At least a 1GB of RAM. At least a free space of 400MB on you device for smooth running. Supports Android V4.0 and above. Size: 75MB for the APK file , 108MB for OBB and 86.22MB for Data. NEW SONGS ADDED: The First Touch Soccer 2018 comes with a new set of song different from the previous version ,to give you a great gaming experience. UPDATED UNIFORM:The First Touch Soccer comes with all latest Jerseys of all Teams to match up to current standard. NEW STADUIMS AND BETTER GRAPHIC:The FTS 2018 comes with latest stadiums so you can now choose between with you want. 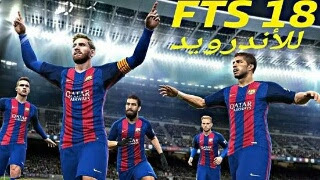 PLAYERS UPDATED:You can npw buy new player on FTS 2018..
You can also download zip file of fts 18 and extract from the folder. Click on the last icon with a tool symbols. emma thanks for the update you are always the best in providing android games update, thumbs up.